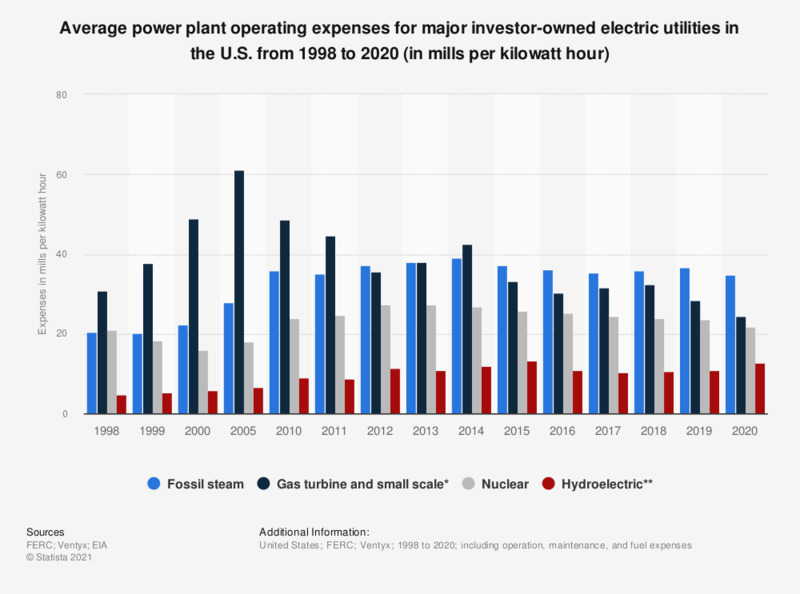 This statistic shows average power plant operating expenses for major investor-owned electric utilities in the United States between 1998 and 2017. In 2017, the operating expenses for nuclear power plants run by major U.S. investor-owned electric totaled 25.36 mills per kilowatt hour. According to the source, a mill is a monetary cost and billing unit equal to 1/1000 of the U.S. dollar (equivalent to 1/10 of one cent). * Conventional hydro and pumped storage. ** Gas turbine, internal combustion, photovoltaic, and wind plants. Figures are compiled from several editions of the publication. According to the source, a mill is a monetary cost and billing unit equal to 1/1000 of the U.S. dollar (equivalent to 1/10 of one cent). Totals may not equal sum of components because of independent rounding. Everything On "Electric utilities in the United States" in One Document: Edited and Divided into Handy Chapters. Including Detailed References. Electricity generation in the U.S.
Statistics on "Electric utilities in the United States"